Here is Some Information about New Vishwanath Temple in Varanasi Uttar Pradesh india. 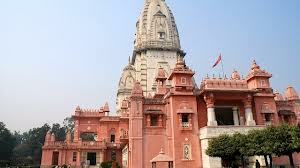 The new Vishwanath temple of Varanasi is located in the premises of the Banaras Hindu University (BHU). Golden temple is the second name with which new vishwnath temple .As Golden temple is also known as Birla family and foundation so the temple is also pronounce by the Birla temple. 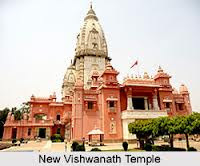 Vishwnath temple is built by the Birla foundation in the honor of lord shiva and its infrastructure is same as kasha vishwnath temple. 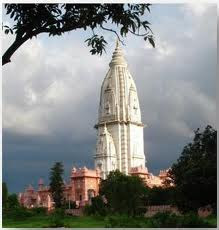 The temple spectacle is designed by the honorable Madan Mohan Malviya the founder of Banaras Hindu University. Mr. Madan mohan malviya was against the discrimination of upper and lower caste, creed and race in the same way temple doors doesn't pursue any discrimination to any person according to their caste, religion, or richer and standard poor. 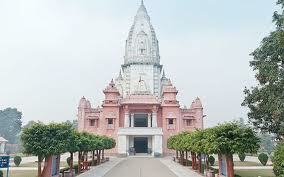 New vishwnath temple is the example of individual dedication towards the lord shiva and its designed in the very beautiful way that no one identify in which one is kasha vishwnath and which is new vishwnath in their infrastructure. 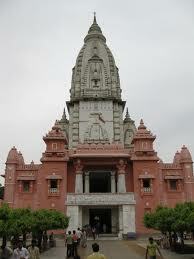 The inner walls of the temple are ornamented with extravagant sculptures according to the Hindu mythology and verses. The door of the temple opens early in the morning at 4am and shut down at 10pm in the night. Everybody is welcomed in the aarti that took place every morning and evening without any partiality and Prasad offer to every lord shiva devotees. As its shiva temple so every Monday people comes to pour milk on the marble shiva lingam and every year since it built on maha shivaratri people organize a Bhandra in which food is offer to every shiva devotee. The food plate contains Aaloo, puri halwa, kashifal and thandai as shiva Prasad devotes first have the food and later serve to other visitors it's the tradition of this temple. 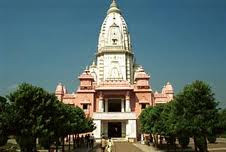 By Road:Varanasi lies on NH2 from Calcutta to Delhi, NH7 to Kanya Kumari and NH29 to Gorakhpur. Some important road distances are: Agra 565 km, Allahabad 128 km, Bodhgaya 240 km, Delhi 780km, Khajuraho 405 km, Lucknow 286 km. By Rail:Varanasi is an important and major rail junction, served by trains from all metros and major cities across the country. It is directly connected with New Delhi, Mumbai, Calcutta, Chennai, Gwalior, Meerut, Indore, Guwahati, Allahabad, Lucknow, Dehradun. 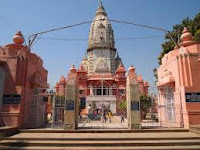 By Air:Direct, daily flights are available between Varanasi and New Delhi from Babatpur airport which is 22 km from Varanasi and 30 km from Sarnath. 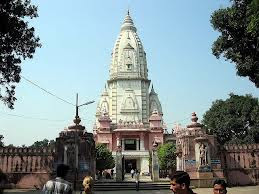 It also connects Varanasi to Delhi, Agra, Khajuraho, Calcutta, Mumbai, Lucknow and Bhuvaneshwar.